Merry Christmas to all of my creative friends! I hope Santa was very good to you, bringing you lots of new toys. 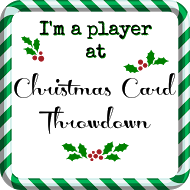 When you've had time to play, please share links to your creative pieces. Enjoy your family and friends. There are just a few days left to download this high-quality vintage images for FREE! 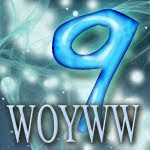 All you have to do is provide this link : http://countdown.tentwostudios.com to your group, blog, website or twitter. So far only Dec. 1-20 have been revealed. She will reveal one new image a day through Christmas. Then they're gone! Don't miss out on your chance to have something new to play with after the holiday rush is over. If you can't wait for the individual reveals, you can purchase the entire download up front. There is link on the countdown page. Please provide us with a link to pics of what you do with the images. We'd love to see! Okay, I've tried multiple times to get these 2 measly little pictures uploaded. So we're going to try it again tonight. Cross your fingers because I'm really proud of this cabinet. This first one is of the cabinet. There are 8 shallow drawers. They will hold the 12x12 paper. I think I can put 1/2 of each color family to a drawer. Each of my 4 Ink Spot collections sit on the top. Behind each one I have a small plastic mesh basket to hold the refills. This will keep all of the SU supplies handy. The magazine holders in the background (right) hold the 8.5x11 In Colors CS. With the holidays nearly out of the way in my world, I'm beginning to put things in place for the new year. One of those is getting back to creating. As I've worked on Holiday cards I felt a sense of peace like I've not felt for most of this year. With my favorite holiday movies playing in the background, I just let my mind and fingers wander where they wanted. I've also started following blogs of other Creative Souls. For over a year I've received SheetLoad of Cards in my email courtesy of FeedBlitz. Now that I have the time to follow them regularly, they are retiring. But bless Crafty Al (Alicia), she is going to continue to inspire on her blog http://callmecraftyal.blogspot.com Not only is Alicia extremely talented but she surrounds herself with other Creative Souls. I look forward to getting to know her in 2010. 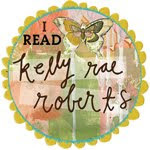 So, while you're looking for a new place to be inspired, drop by Alicia's blog and say Hi. She loves company and will be happy to see you. Finally found the elusive pics of the cabinet I bought at auction this past spring. It was listed as a 'scrapbook cabinet'. I picked it up for $5. The eight long, shallow drawers are perfect for storing the SU cardstock by color family. Spreading them out in a step-fashion, I can use 2 drawers per color family with plenty of room. In a couple days I'll have pics of the ATCs I just finished for a Halloween swap. Okay, I have yet to see a copy of the new Polymer Cafe Magazine but the president of my guild emailed today to say she read the article and loved it. Now if my copy would just get here! So if you're into beading, polymer cafe or just wonder what the heck I'm talking about, the Dec. issue of Polymer Cafe is at your local Borders, B & N, Michaels or Hobby Lobby. PC is the only magazine dedicated solely to the polymer clay industry. I'll have another article coming out after the first of the year. I finally got the pics taken of the paper storage unit and will be posting it on Monday. I thought I'd better grab a pic while the desk in the background looked like a work space and not like a stamp and paper store exploded all over it. :-) I cleared the space and got to make some Halloween themed ATC's. I'll post pics of those just as soon as I know the gals in the swap have received theirs. When we moved to this Ozark oasis two years ago, we went from an eleven-room Victorian with lots of space to a 2-bedroom ranch. In the Victorian I had a 7'x18' office and a 10'x10' crafting space. In the new house, this all had to fit into a single 11'x15 space. I decided the best way to accomplish this was to create two separate working areas. On the East and South walls I have an 'L-shaped' counter space for the printer/computer/stereo. The counter is anchored on both ends by base kitchen cabinets. Lots of storage for all the paper and computer programs a writer could need. The West wall is a large 3-sectioned unit of shelves from a video store close out. The unit is jam packed with books to be read (TBR pile), research books for my novel writing and collectors books - many of them dating back to the late 1800's. When my daughter left home the year before we moved, she left behind a large entertainment center. Leaving it behind was much easier than taking it apart. :-) Her loss was my Gold Mine. I knew this is where all of my rubber stamping/ scrapbooking supplies needed to fit. So in this new house, the Entertainment Center took on a whole new life along the North wall. I laid out all of my stamp/scrap supplies and designed drawers for everything to fit in. Then I gave the dimensions to my capable hubby. 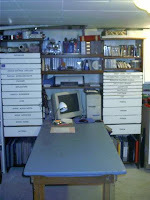 Using the shelves we removed from the old craft room and sheets of underlayment, he constructed the drawers. Here's what my Creative Space looks like now. I also have added a 8-drawer scrapbooking cabinet that sits at the end of the table (drawers facing out). I covered the top with slipguard shelf liner in a matching blue. On top I keep all of my SU ink spots and ink refills. The drawers each hold color families of the 12x12 SU cardstock. Since my daughter and granddaughter moved into the basement, I don't get the frequent use of the space but when I do, it's nice to know where everything is. Do you have a space to call your own? Post a comment and include a link to your site and share yours with us! Whatever normal is or as close as it will be for awhile. I'm finally making time to play with my toys again. The keyword there is 'making'. I have to make time to play, to read, to watch my favorite TV show... whatever. I'll have pictures to post in a couple days and as promised, a couple people to introduce you to. So hang with me. It's going to be FUN! I've been working on this project for several weeks. It is still a work in progress. The picture left reminds me of Monopoly deed cards. The Name Tab is printed on it's color of CS. 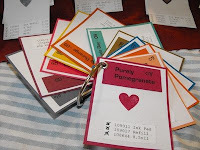 I've then stamped a heart from the Mini Messages set in the coordinated ink color. This lets me see the true ink color on white. At the bottom of each I've printed out a tag Bulleting the order number for the Ink Pad, Ink Refill, Marker, 12x12 and 8.5x11 CS. When I have that item, I'll put a check mark so I know instantly what I have and what I still need to order. When I have a package of the cardstock, I'll mat each one with the CS. The reverse side of the mat is large enough to audition colors for a project, I simply pull out my Swatch Ring and decide what colors to work with before even going to the drawers. I hope today's post finds all of my friends enjoying a safe and happy holiday weekend. It's quiet here in the central Ozarks. Hints of storms loom overhead, threatening to wash out any fireworks displays. I would like to have taken my granddaughter to see some tonight - our first 4th of July together. Instead, it sounds like an early night for her and a writing night for me. I wanted to play with the layout. I hope you like it. 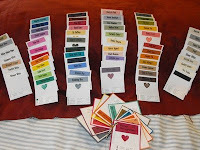 I've finally made time to add links of some of my stampin' friends. These are gals I go to when I need a little inspiration. Next time you find yourself wanting to play with something different than the 'same old same old', check out their sites and you'll be back on track. One of my favorite places to go for inspiration is www.splitcoaststampers.com If you've not been, you're in for a treat. Start with the GALLERY. More ideas there than you'll use in three lifetimes. Such creative people at SCS. I say people because you'll find some really talented guys as well as gals posting their samples at SplitCoast. SCS also has a wide variety of forums - everything from introduction to stamping/scrapping, tutorials, challenges and swaps just to name a few. A wealth of inspiration and information - FREE! You'll browse for hours so tuck the kids into bed, hand hubby the remote, grab your favorite beverage and take some personal time. I have some things I'm playing with and hope to post early in the week. Our theme for the ATC swap at the Ink Spot in Kirkwood MO was Medieval. I had the idea to do a shaker ATC. 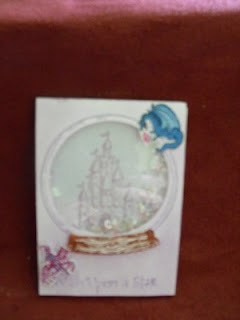 I used a retired set from Stampin Up - www.stampinup.com called SnowGlobe. I couldn't find small enough stamps for the dragon or knight images so those were pulled from my PrintShop program. I used SU chalks to dust the background and SU inks for the stamped images. It's been a couple of weeks since the convention and I've lagged. It's just been too hot to want to do anything. The convention was active. There were not any local vendors present but I was able to connect with the ladies from the Missouri stamp group I belong to. Among them was the ATC swap coordinator from The Ink Spot in Kirkwood MO. A bunch of us met in the lobby of the convention center for a ATC swap. Very creative ladies. I ran out of ATC's before I got the opportunity to meet a very talented young ATC artist. She was only 12! Looking through her book, you could see how she has already grown as an artist. There are great things in store for this young lady. I found a stamp I'd been on the hunt for at www.stampsbyjudith.com I've shopped their booth before and never ever been disappointed. In a couple weeks I'll be featuring an artist I met. Her name is Darlene and she does FABULOUS things with masking. I'll have a link for her company with the feature. All in all I was impressed and came away with lots of ideas and new toys. It's a beautiful day in Collinsville IL. Almost too beautiful to spend it wandering around an air conditioned exhibit hall all day. I say 'almost' because I'm going to be spending the time looking at booths and booths of rubber stamps and supplies. I wasn't suppose to be here this weekend but by the blessing of my grand daughter, I get to be here. Mommy is taking her to the St. Louis zoo. I'm hoping to find St. Louis papers and embellishments to use for her outing. I'd think there'd be local vendors, right? We'll see. With May being graduation month, I've had to make time to get some cards done and I think that is the key. Like my writing, if I want it I have to MAKE time for creativity or anything else I enjoy. So here's hoping I can be back in here on a regular basis and build the blog to theinteractive venue I first invisioned. So here's to a fresh start in Creativity! 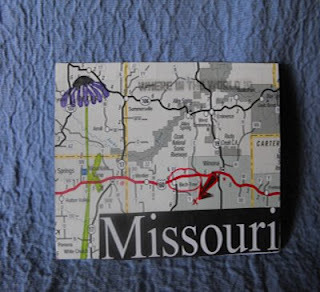 The Missouri stamp group did another postcard swap. This one had a spring theme. I enjoyed playing with the shaving cream technique for the background. The markers were my LePlume. Even though most of us are from IL, BirchTree is a tiny little town in the Ozarks that unless you are from this area, you probably don't even know it exists. So, welcome to Birch Tree MO! With the help of my local chamber of commerce, I took state maps and cut out the area I needed. I wanted to use clear embossed glue dots to highlight the town but of course I was out and no place in the area had them. I improvised with the red pen and used a red arrow to point to my house. The cone flower is the state flower. I picked the stamp up on my trip to IL last week. I used LePlume markers and spritzed them for a water-color effect. For a final touch (though not really visible), I used the slick tape transfer to add the title to the card. I enjoyed making this one. Next month is One Day Of Creation. Hmmm... gonna have to think on that one. I'm enjoying my visit to central IL. I have access to Michaels Arts & Crafts, Hobby Lobby, Jeffery Allen crafts and JoAnne's Fabrics. I'm like a kid in a candy store. Today, I made the plunge to Copic markers. The girls at Splitcoast Stampers - http://www.splitcoaststampers.com/ - love the way these markers blend without muddying. So when things settle down at the house with the new additions to our household, I'll play and post. Be watching in the next couple weeks for new Spring Postcards. I've joined a swap with my Stamp&Scrap group and those postcards need to be mailed by end of the month. I already know the stamp set I'm going to play with and I bought new springy Basic Grey papers today. The creative juices are flowing and I'm not home to play. Now that the daughter and granddaughter are here and we're finding a routine, I have finally found time to get into my creative space. It felt wonderful! This is one of 2 birthday cards I was suppose to have done for February. Carol enjoys ATC's so I pulled colors from the Oriental ATC to make a card and included one of the ATC's. I was able to upload the photo to my gallery at www.splitcoaststampers.com Not sure why Blogger wanted to argue. This month's theme at the Ink Spot is Food. Deciding on the design for my ATC was easy. I love chinese buffet. A friend of mine and I once made a trip to OK City from Peoria IL for a writers conference. When it was time to eat, we managed to find a chinese buffet for every lunch or dinner stop we made. There was even one right across from the conference hotel where we were staying. I can eat at a chinese buffet seven days a week. For this ATC, I took my color cue from the take-out menu of our local chinese buffet in West Plaines MO. - Diamond Head. They've been rated the Top 100 Chinese Buffet's in the country. I used red and black. The dimensional items are from my Photoshop program. Blogger is arguing so I will come back and add either the actual photo or a link to where it can be seen. Thanks for stopping by. I participated in a Valentine postcard swap with my Scrap and Stamp yahoo group. I've found I like working in collage. Something about the mixing of textures and prints and colors just sets the imagination into overdrive. What are you creating? Please link me to your page and let me see. I've spent the last couple days making collage valentine postcards for a swap and for friends. I'll get the pics taken this afternoon and, should the dial-up cooperate, uploaded here. 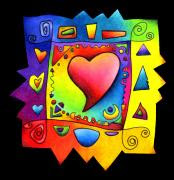 What are you creating for the Day of Love? Tell us what you're doing and link us so we can peek at your creativity. And a new quest to nourish my artistic soul. 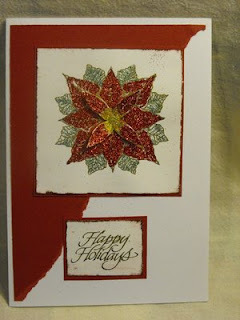 One of the ways I’m doing that is by participating in a challenge at http://www.splitcoaststampers.com/ The idea is to determine how many Christmas cards you will need to mail in November of 2009 and divide it by 11 months. I didn’t get any Christmas cards mailed this year. Instead, I sent New Years cards. Nice, but I’d rather remember my family and friends at the beginning of the holiday. My pledge is to make 10 Christmas cards every month between now and mid-November and to have them done by the 25th of the month. I don’t mail 110 Christmas cards but I do hand out to close family and friends as well as the 30 cookie/candy trays I give to area businesses. So yeah, 110 should cover everyone easily.